Spies in the Sky -- Is Your Privacy at Risk? Imagine yourself and your companion basking in the sun at the local park, sipping on chilled fume blanc and nibbling petit fours when you hear a whirring sound approaching. Looking up you see a miniature version of an alien spaceship slowly cruise then hover about 50 feet above your picnic. It pauses, then flies back from whence it came. "What in the world was that? A UFO?" asks your companion. "That was a UAV -- Unmanned Aerial Vehicle -- a drone." You turn to your companion, cocking an eyebrow. "Didn't you say your Dad bought one recently?" Sound far-fetched? Not even. The uproar over the prying eyes in the skies has been sparking legal debate over the past year, and is reaching a fever pitch. Just recently sunbathers and picnickers at a public park in Tiburon, Calif. called for a ban on drone use. The drone, as reported by the Pacific Sun, "Loudly moved several feet above the fields and walking path. It hovered for minutes over three women at the water fountain." Are the three women victims of an illegal invasion of privacy? That all depends on where you are. And by whose rules you abide. In general, the three women could take the drone operator to court if they could prove that their "reasonable expectation of privacy" had been violated. If the drone operator were saving images for his own use without permission, they would have a stronger case. If the drone operator were selling the pictures, the FAA would be able to impose fines. As of today (and it could change tomorrow), commercial drone use -- that is, using drones for profit -- is prohibited by the FAA. But the distinction between what constitutes "private" or "hobby" drone usage and "commercial" usage has many scratching their heads. Techdirt writes: "Lots of people are pointing out that the FAA's claims are likely to ground the high profile plans by Amazon to deliver packages by drone, but it's some of the other things that are on the prohibited list that strike me as even more ridiculous." One rule in particular has prompted some scathing criticism. According to the FAA, it's okay to use a drone in your garden to determine which areas need watering, but it's not okay to do the same on a commercial farm. As one comment to the Techdirt article asks: "Who plants enough crops that they need a drone to be able to tell what sections need more water, but aren't involved in a 'commercial farming operation?" Landscape and nature photography, where allowed, is permissible by the FAA so long as the photographs can be viewed by the public at no charge. Despite the FAA guideline, several national parks have outlawed drone use, for both personal and commercial use, but not without objection. Artist Jim Bowers, who has been photographing park lands from the air, said "I'm creating artwork and trying to document the beauty and majesty of that nature for people around the world who might not ever get to see it," said Bowers. "They're obviously using this rule to keep us grounded." When it comes to photographing real estate from the air for the purposes of buying or selling a property, the FAA says no. In some cases photographing real estate from the air can constitute an invasion of privacy. For example, last June Business Insider reported an incident where a woman was in various stages of undress when a drone appeared outside her 26nd floor Seattle apartment window. Upon investigation, it turned out that the building was being photographed by a commercial real estate agency. No charges were filed. Emerging state regulations governing drone use, which can vary dramatically from state-to-state, further muddy the waters. According to The Washington Post, Oregon, Idaho and Tennessee make it illegal to fly a drone over private property without the express written consent of the property owner. In contrast, Texas allows drones for "scholarly research" and for photography of people on public property with the "consent of the individual who... lawfully occupies the real property captured in the image." In Nevada and Mississippi drone operators are only bound by FAA regulations, though a recreational flight over Area 51 is probably not a good idea. It's not uncommon for federal laws to be in conflict with state laws (e.g. marijuana laws) so it behooves both hobbyists and commercial drone operators to be familiar with the regulations in the area where they intend to fly. According to the FAA-sponsored site, Know Before You Fly, "The use of unmanned aircraft systems (UAS) for commercial or business purposes is authorized on a case-by-case basis. 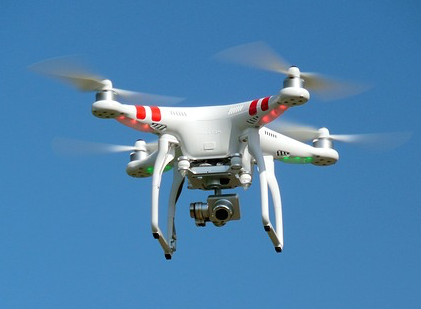 You may not fly your UAS for commercial purpose without the express permission from the FAA. You should check with the FAA for further determination as to what constitutes a commercial or business use of small UAS." Recreational use of drones does not require FAA clearance, however local laws may prohibit even recreational use. There may come a time when you'll be able to hang out with a companion in a public park, order a burrito from Burrito Bomber on your smartphone and have it delivered by drone. Of course if everybody in the park orders burritos at the same time, there may be a bit of aerial chaos. Suffice to say the devil is in the details. But whether you're a drone operator, a citizen with privacy concerns or both, it may be a while before clear, consistent, enforceable laws governing drone use are on the books.